I had placed myself on a ban for some time when it came to new cookbooks – not only for economic reasons but also because I have so many with little post-it tabs still awaiting attention from me that I really wanted to get through before adding any more to the pile. But as soon as I saw Jerusalem I knew that it had to be mine and I am very glad I relented. This is a really beautiful book and there are so many things I have earmarked already to try but I instantly knew following my initial look through that this cake had to be first. 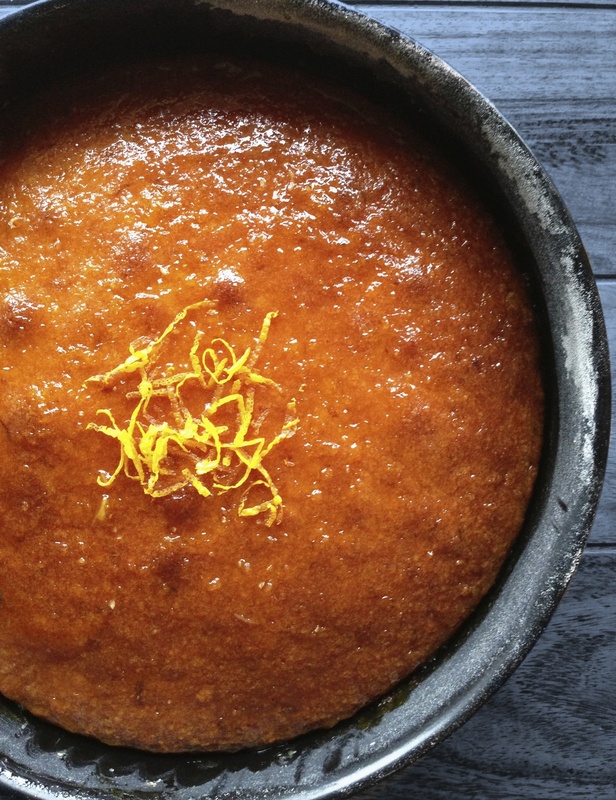 It’s one of those beautifully damp, sticky, fragrant cakes that are perfect served with some whipped cream or yoghurt for dessert or just as it is with a cuppa. We loved it. The other thing that I love about this cake is that it gets better over a couple of days and lasts really well for at least 3 or 4 in an airtight container, which makes it perfect for baking at the weekend to have something nice on hand throughout the week. I don’t know whether it is the lovely sunset colour of the cake or the fragrant orange zest scent that fills the kitchen but this cake always reminds me of a warm summer evening and that is the perfect antidote to a dreary wet day on the west coast of Ireland. 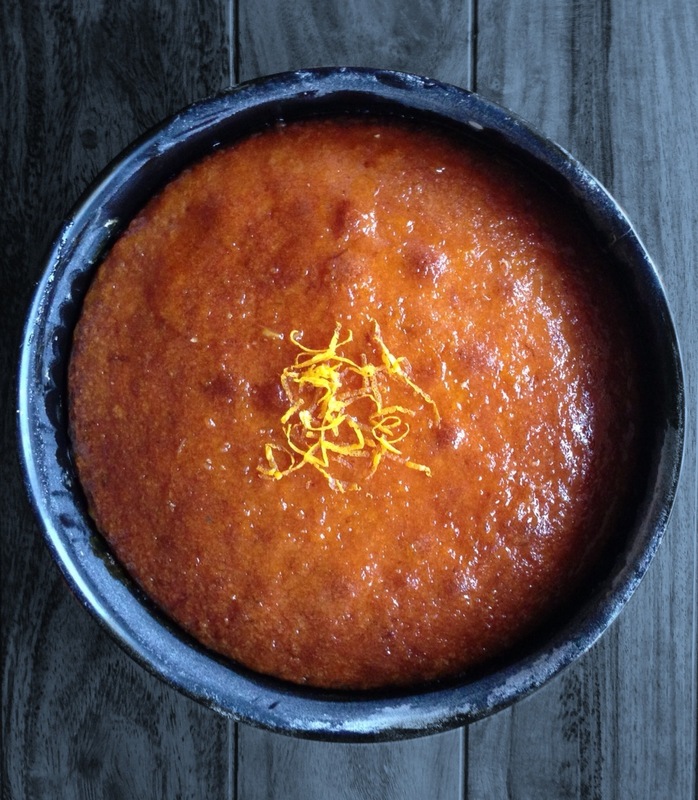 In the book the cake is actually called Clementine and Almond Syrup Cake and oranges are a recommended substitute but having tried both I prefer using oranges – both for the stronger flavour and also the ease of juicing and zesting – Clementines are very awkward to zest! One other thing, when making damp cakes like this I tend now to just grease and lightly flour the tin rather than line with parchment – it’s much quicker and the cake turns out easily. Preheat oven to 160ºC (fan) and grease and lightly flour a 24cm spring form tin. To make the cake beat the butter, caster sugar and zest in a mixer on a low speed until well combined. Add half of the ground almonds and mix through. With the mixer running still on slow add in the eggs one at a time, stopping every now and then to scrape the sides and bottom of the bowl. Add in the remaining ground almonds, flour and salt and then mix again until smooth. Spread the mixture in to the cake tin and then bake for 50-60 minutes (check by touching the top of the cake – it should feel firm – or insert a strand of uncooked spaghetti, which should come out clean). Just before the cake is cooked – at around the 40 minute mark – place the ingredients for the syrup in a small pot and bring to boil, then turn the heat down and allow to reduce and thicken to a syrupy consistency, this should take around 10 minutes on a low heat. When you remove the cake from the oven run a sharp edged knife around the edge of the tin and then brush the top of the cake with the hot syrup, making sure it all soaks well in to the cake. Garnish with the strips of zest and leave the cake to cool completely in the tin before removing it. This cake will easily serve 12 for dessert. I thought this was the cake that I make for a minute but mine’s from Polpo and is unbelievably f***ing gorgeous. It involves boiling oranges whole (skin and all) for an hour and pulverising the lot in the food processor. Oh that sounds like one I tried before from one of Nigella’s books – either How to Eat or Domestic Goddess, but it was very bitter so I’m not sure if it was my clementines. Must check out the Polpo one. Do you have the book? Is it good? That one is deffo from Polpo and is GORGEOUS. I love the book but you’re not allowed to buy any more. Mine too! Hope you enjoy it as much as we did.